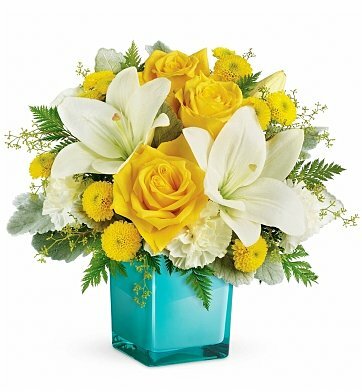 This lighthearted bouquet of golden roses and fragrant white lilies is presented in a stunning aqua cube vase. The contrast of sunny blossoms agains the aquamarine vase is sure to be remembered. Yellow Matsumoto Asters, Lush Greenery and more. Standard Arrangement Measures 15" x 13". Golden Laughter is a hand delivered gift. These gifts are delivered by one of our local design centers located throughout the United States and Canada. Same day delivery is available for most gifts when ordered before the cutoff time. The cutoff time for Golden Laughter is 2 PM in the recipient's time zone. I live in England and order flowers to be delivered from over here on the same day I require delivery ,never a problem so I order with confidence. Saw a photo of the actual arrangement, as I often do when I send flowers, and it was just like pic. Awesome!